Transfer from your hotel by air-conditioned vehicle. Head north to the Phang Nga Province. 10.00 Arrive at the white water rafting camp, Tone Pariwat Wildlife Sanctuary. 11.00 Attend a safety briefing session. You will also be provided with helmets, life jackets, etc ahead of the tour. 12.00 Enjoy a Thai lunch and take some time to relax. 13.30 Take a 4 wheel ride. 14.30 Enjoy soft drinks, coffee or tea. 15.00 Depart from the white water rafting camp. 17.00 Arrive back at the hotel. Enjoy our sea canoe tour in Phang Nga. 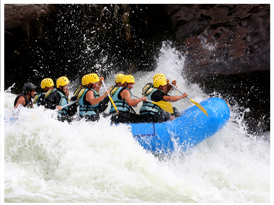 Whitewater rafting is relatively new to Thailand, and is especially good during the months of June to November. Simply, as these months have higher rainfall. This tour, in Southern Thailand's beautiful Phang Nga province, takes you on an action packed ride along mountain rivers fringed with forest. Be prepared to get very wet. This is a fantastic day out for everyone who enjoys adventure. Please remember to bring with you towels, swimsuits, dry clothes, non-slip shoes, and sun block. You will be assigned a personal locker at the site.